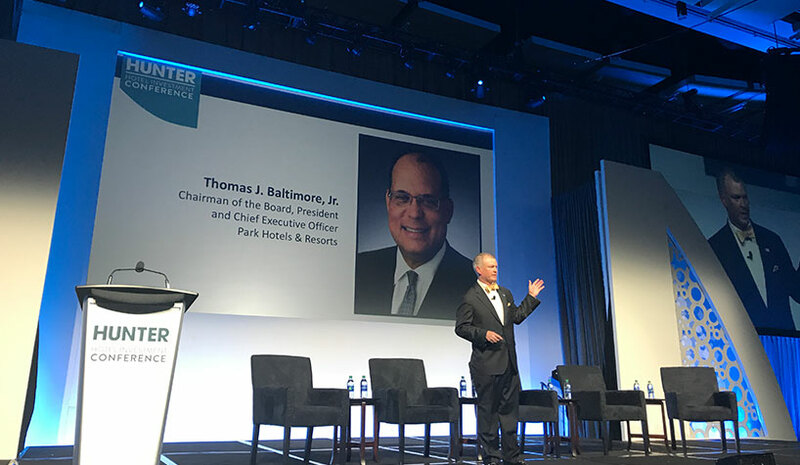 ATLANTA—On day one of the Hunter Hotel Investment Conference, industry leaders discussed customer experience, margin erosion, soft branding, Airbnb and the economic outlook. Taking center stage first, Lee Hunter, COO of Hunter Hotel Advisors, welcomed more than 1,800 attendees from 40 different states and three different countries to the Atlanta Marriott Marquis. Loyal customers cost less than acquiring new ones, are less price sensitive and generate positive word of mouth. Loyalty challenges businesses face include the increase in customer expectations and competition, and decrease in effectiveness of traditional marketing. Business results are achieved through experience. Experience is the sum of interactions with a company. Barriers to experience include organization silos, cost concerns, and product or service dependence. Experiences need to be personal, emotional and on-brand. Margin erosion in the industry is real. How can the industry combat it? “We should rethink the business model,” Oakes said. Should the industry begin charging customers when they book? How are land costs impacting investments? Land costs have increased significantly. For example, Vision Hospitality Group’s Fairfield Inn & Suites by Marriott Nashville Downtown/The Gulch was developed for $18 million. It was recently appraised for $42 million. Soft branding can help hoteliers, especially when it comes to distribution channels. Where’s the industry at in the cycle? “No tree grows to the sky forever,” Oakes said. While nobody has a crystal ball, the storm is coming, so be prepared, Patel said. If there’s a dip, build your market share, Greene said. On Airbnb, hoteliers should welcome the competition, but fight to level the playing field. In 2018, U.S. continued to lose travel market share, but international travel expanded 6% globally. Hotel demand is setting new norms (2018 Q4: 3.9 room nights per capita). Hospitality has led total job growth in 95 of the top 100 U.S. cities. U.S. will be fastest G-7 economy in 2019. What’s the number one risk to the economy? The trade war hitting global growth. Be prepared, but don’t give in to the fear. Blackstone’s hospitality business is holding up well, according to Trebilco. Morse: MCR is a net buyer this year. “There’s plenty of opportunity out there,” he said. On the industry’s future: Nobody can predict it, Merkel said.